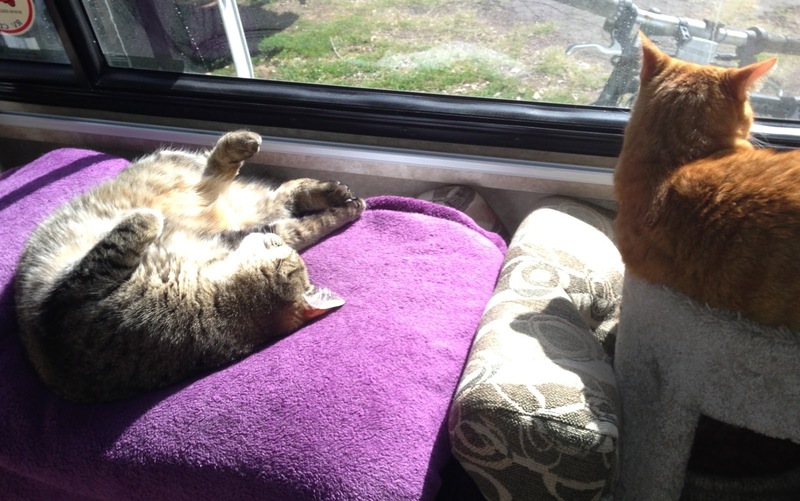 The photo demonstrates how one is to be totally relaxed in the sun beams. Tucker wins on this one, Norm is semi-watching the world go by. I’m still here at my friend Scott & Denise’s home. I was going to leave today, but reading weather maps on either N or S direction I considered, it was smarter to just stay here until Sunday or Monday. The southern route, right now, is much hotter than I desire and with hot winds on top of it – no thank you. Its to cool back to more seasonable temps by Monday. The I-40 route, would have been good to travel today or tomorrow, but since it will take me two days to get there – it runs right into the first Spring storms of the season. Again, Monday looks like a better run of good weather. But between now and then – everyone will get a dunking it seems. So will sit tight instead of driving in rain, winds and/or thunderstorms. As I still remind myself, I don’t have to move now… I can wait these storms out, so I shall. Scott & Denise have been the most gracious hosts. Its been a delight to have spent this time with them. And they have allowed me to get caught up on paperwork that needed to be tended to, by letting me print off stuff, and mail it. Yesterday, Scott dragged out the hose and let me fill my water tank in my rig. Wonderful water!!! Then I sprayed off the salt spray that had oddly landed only on horizontal surfaces on my rig back in Corpus Christi – that was hard to get off! Windshields took several washings to get the crap off. So yesterday, I sprayed with water and tho I did not use soap, the finish is once again smooth. I am most curious what this was, as I have parked next to the ocean in Alaska and did not get this stuff on my rig. I probably will never know. Scott made my day and then some, when he made me a loaf of homemade bread, delivered it hot to my door on a bread board, with knife and a towel to cover. Oh my…. the butter just melted on the heel of that loaf… the first bite, my mouth accepted it gleefully, my eyes closed and the simply joy of it all wrapped me around the whole experience. Gosh, its been years since I’ve had this pleasure.. Thanks Scott! Then last night, I was invited to join them for chili for supper/dinner. Afterwards, I got a chance to watch a video of a tribute that pertained to a mutual friend of ours, who has since died of pancreatic cancer. I had no idea that Scott & Denise even saw Geoph after school. It was an awesome tribute and Geoph would have been honored, humbled I think. As that was the way he was. So that was an unexpected event to experience. Wow! And I learned a little more about Scott & Denise in the process. It has been a great stop in this moment in time for me.